I want to share with you something I have been benefitting from for years. About 10 years ago, I noticed that my feet started burning, especially in the evening after a long day at work. I thought it was just from being on them for long periods of time. Then I learned about a "new" old concept. Native cultures have long held that the earth itself is healing, and that being in contact with it helps people improve their health. Of course, modern medicine dismissed this belief as primitive and uneducated... until now. Clint Ober had an electrical background and realized that animals could live under high tension power lines, but humans could not. After much research, he realized that animals were electrically grounded, and humans were not because of wearing plastic shoes and walking on floors that were not conductive. He started experimenting, and found that being electrically grounded (which he termed earthing) decreased pain, starting with his own 30 year old chronic back pain. He then pushed for a medical doctor to follow up on his findings, and finally bugged one cardiologist long enough that he agreed to disprove the theory just to get Clint to stop bugging him. Much to the cardiologist surprise, earthing normalized cortisol levels, bringing low cortisol higher, and high cortisol lower, ultimately helping to improve people's healing and their circadian rhythms (sleep/wake cycles). Over time, many other benefits have been discovered. Some of them help decrease pain, others help to decrease the risk of heart attacks and stroke. Still others included decreasing inflammation and acting as a antioxidant. 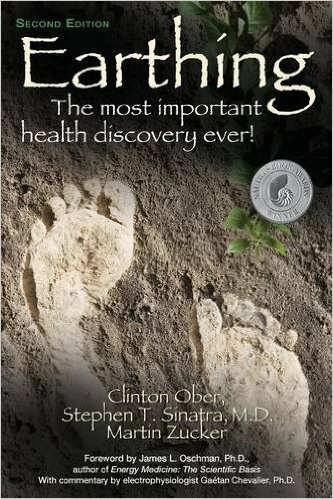 Clint Ober wrote a great book on all the benefits called Earthing. You can get it here. So how do you earth? But here is the problem for me. How can I touch the ground for long enough each day? I can't be outside for very long. And during the winter, I don't want my shoes off! I purchased an earthing sheet. Now I can be earthing 8 hours a night... well, maybe not quite that much =) When I started earthing, within 2 days the burning was gone in my feet. Well worth it for 10 years of antioxidant therapy! There are other ways too. Earthing mat, wrist bands, wrist rests for the computer. These are great ways to be able to earth all day while you work. Here is a link to a complete earthing set on Amazon. Remember, even if you can't get an earthing sheet, get outside with your shoes off, take a bath, put your feet it the water, even washing your hands and taking a shower give you extra electrons, which is what grounding does for you! PS - I would love to hear your experiences with earthing. Send me an email.